I found my sailing “dream boat” in the spring of 1979 while racing on Lake St. Clair in Michigan. Everyone had heard about the hot new boat in town, and we were anxiously awaiting the appearance of this new Pearson 40. She made it to the starting line just before the race started and sailed by in a good breeze with a bone in her teeth. I was blown away. In my eyes, she was stunning. At that moment I told myself, “That is my dream boat.” It took 20 years, but the stars finally aligned, and I bought my Pearson 40 in 1999 and renamed her Passion. The boat was pretty rough cosmetically, but my primary concern was the condition of her hull, deck, rigging and systems. I knew I could bring her looks back, but did not want to find out after buying her that she had major structural issues or wet balsa core problems that would make a refit unreasonably difficult. So, before writing the check, I enlisted the services of an expert marine surveyor to do an in-depth analysis of her condition, with an emphasis on moisture content, delamination and structural integrity. We spent hours tapping, exploring and testing, and in the end I received, not surprisingly, a combination of both good news and bad news. The good news was that structurally she was in very good shape, with only two small areas of wet balsa core and no delamination. The bad news included a bad case of bottom blisters, old outdated wiring, a contaminated fuel tank and aging hoses that needed replacement. Most of the running and standing rigging also needed to be replaced. After the price was adjusted to compensate for all of this, Passion was mine, not yet a true “dream boat” but a solid platform on which I could rebuild. Of course, at this point, I could have started tearing the boat apart immediately to begin the refit. But instead, I decided to sail her for a few years to better learn exactly what she needed, where she had problems and what I wanted to change. Those four years also allowed me to attend a few boat shows to look for new ideas and equipment. Looking back on it now, there is no question that was one of the best decisions I could have made, and I would recommend anyone else planning to buy and refit their dream cruising boat do the same. Not surprisingly, after sailing Passion I had a long list of stuff I wanted to change, including a number of things I would never have otherwise considered—including a nav-station reconfiguration, greater fuel capacity, improved and expanded storage, a reduction in the number of berths, a better icebox, improved rudder design and dramatically improved access to the engine and systems to ease maintenance hassles. Finally, with those four solid years of sailing behind me, I started in on rebuilding my dream boat in 2004. Standards aside, another important step I took when I started the rebuild was renting a 3,000ft industrial warehouse with a side yard where I could put the boat while she was under repair. I also modified the 600ft office inside the warehouse into an apartment by adding a shower and kitchen sink, which allowed me to live within a few steps of my project. I called this property the “warehome.” Technically it was a violation of the certificate of occupancy, but I won’t tell if you won’t. The back 2,400ft of my warehome provided an open workspace for large parts fabrication, a simple and paint booth, and storage space for my tools and all the equipment and parts removed from the boat during the refit, not to mention an extensive selection of wood, fiberglass, coatings and other materials. In the end, this setup allowed me to efficiently work on the boat with few wasted steps. It also allowed me the room to properly organize everything from the raw materials to components and gear removed from the boat. I cannot overemphasize how important this degree of organization was to the success of the project. 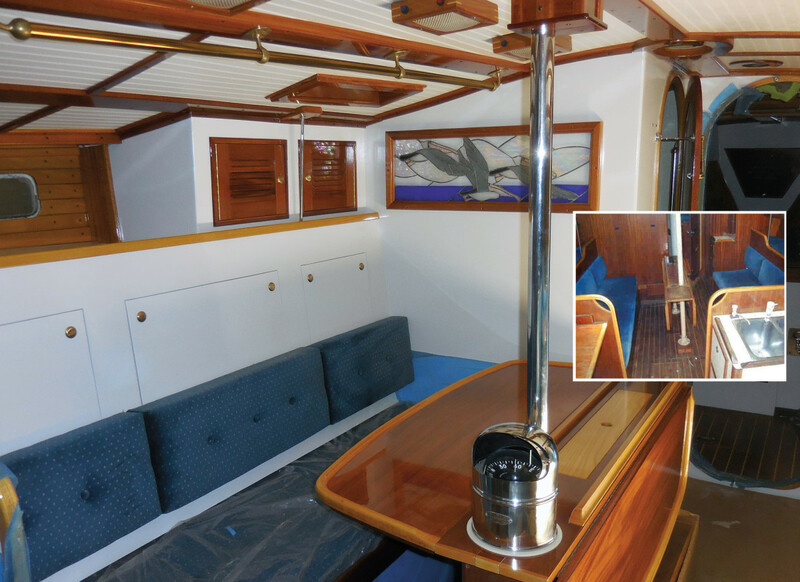 As an example, there are over 300 separate pieces of mahogany trim throughout the boat, and I had nearly 100 spools of marine grade wire of all gauges and colors. Overall, I estimate there were more than 2,500 individual items used to complete the rebuild. It would have been impossible to manage that number of items without good organization. I went so far as to list everything removed from the boat on a spreadsheet. Marine OCD strikes again! 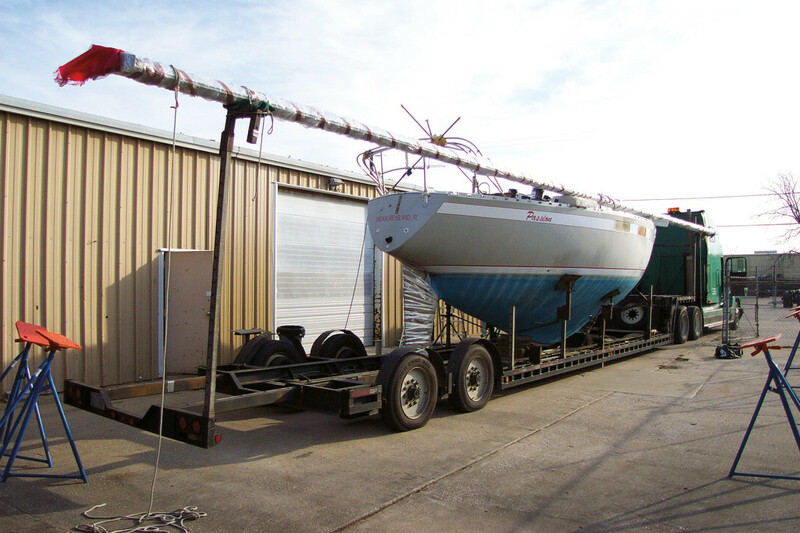 Next, I worked with a boat hauler to truck the boat from the marina to the warehome, where I had her craned into her temporary home. Prior to shipping her I also purchased eight Brownell boat stands and had a welder build two steel pedestals to set her on, as opposed to using wood blocks. Once Passion was sitting in the yard, the work began in earnest. 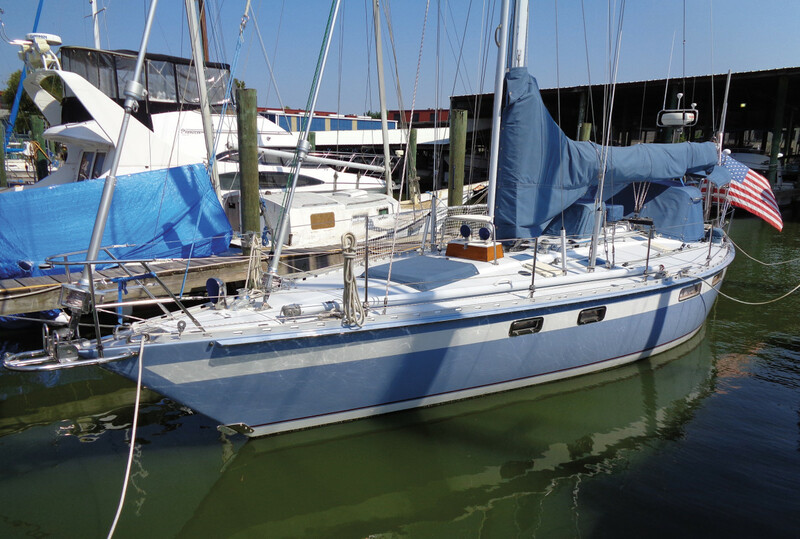 I started with a modest 3- to 5-year plan, but my OCD promptly took control, and the job very quickly mushroomed into a total rebuild that included removing and replacing all systems (engine, electrical, plumbing and propane); replacing the water, fuel and holding tanks; repainting the hull and deck; and completely reconfiguring and refinishing the interior. The actual amount of time spent working on the boat I estimate to be about five to six years, but due to several job-based interruptions where the boat sat for extended periods without being touched, the total calendar time was 14 years. Insane? Probably, but I had to get it right. Ed Note: Sadly, Chip passed away aboard his beloved Passion shortly after this story went to press. Chip was a fine sailor, a great person to work with and we at SAIL will miss him.